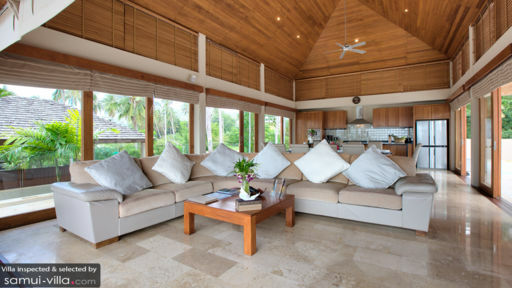 Villa Ayundra has all the essentials of a luxury beachfront vacation rental. From its enviable location and picture-perfect surroundings (complete with vistas out to Angthong Marine National Park), to its immaculate décor and impeccable service, the villa leaves not a single guest wanting for more. Five bedrooms house 10 guests. Careful attention to details is given in furnishing the bedrooms - from the design to choice of materials. Top quality wood and marble are used in the décor, and each room is bright, airy and generously proportioned. The master bedroom occupies a prime beachfront location, two of the rooms are set by the poolside (next to the sala and bar) and the remaining rooms are located below the living area. Amenities like double beds, 32-inch flat screen TVs, DVD player, air conditioners and private en suites are common across all bedrooms. 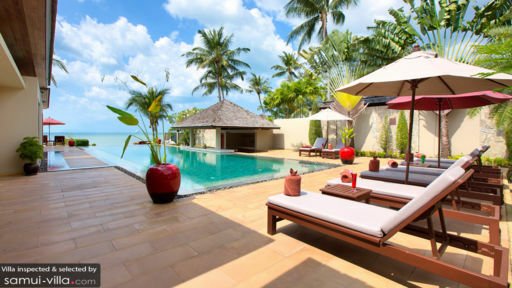 A neatly manicured lawn, sparkling 20-metre infinity pool, poolside bar, charming Thai-style sala, recliners plonked down in prime spots that overlook the sea - Ayundra definitely ticks all the right boxes as a tropical holiday home. Floating platforms dot across the pool waters, leading guests closer to the beachfront. An outdoor dining bench accommodates 10 for al fresco meals. A sala located away from the pool and equipped with sofas and a ceiling fan offers a cosy, comfy spot for shaded siestas. Ayundra’s finely appointed living spaces combines European and Thai design elements. The furnishings, set in various cream and earth-toned hues are stylish and contemporary: an L-shaped sofa with plump throw pillows wrap around a 50-inch LCD and Bose surround sound system in the indoor lounge. The wood-dominated open kitchen is undeniably chic, and comes complete with polished black countertops and amenities like a wine chiller, stainless steel oven, stove tops and microwave. If dining out is not an option, an indoor dining set comfortably accommodates 10 guests. With its uninterrupted sea views, lofty ceilings and a sense of spaciousness, the dining area offers just the right ambience for hosting dinner parties. The interior may be kept cool with air conditioners or ceiling fans on balmy days. Looking to get a workout? Sweat it out in an air conditioned fitness room equipped with bench press machine, exercise bike, treadmill and shower. Ayundra offers nothing less than spectacular service. Daily housekeeping from on-site staff, concierge for tours and activities, airport transfers, e-concierge service and daily breakfasts are included with your stay. In-villa chef services for lunch and dinner (complete with grocery shopping) are available at request. 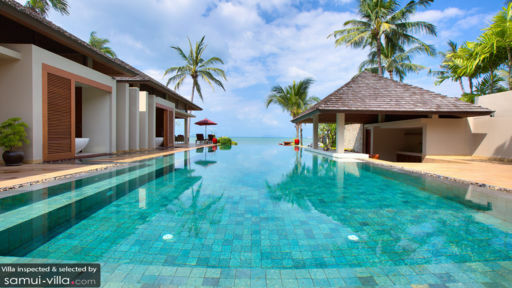 Located in the western region of Samui, Lipa Noi enjoys a remoteness and tranquility that the popular tourist hubs of the east lack. While Ayundra offers incredible in-villa dining experiences, there are times when you’d like to switch things up with restaurant dining. Check out Nikki Beach Club, The Five Islands, The Island View Restaurant or Big John’s Restaurant. Lipa Noi Beach, with its powdery white sand shores and family-friendly ambience is about nine minutes’ drive from your villa. Do note that tides are present in the seas in this area, even if the waters are shallow for about a hundred metres out from the beach. It’s also fun checking out sites like the Nathon Night Food Market (eight minutes’ drive), where you’ll get a glimpse into the local street food and shopping scene. If you’ve a need to unwind and relax, try out a yoga class at Marga Yoga (17 minutes’ drive) or indulge in the spa rituals offered at Baan Thai Spa by HARNN at InterContinental Samui (17 minutes’ drive). Carve out a day for a day trip out to Angthong National Marine Park. An archipelago of 42 islands, this Instagram-worthy attraction is great for sunbathing and swimming, as well as water sports like snorkeling and kayaking. To get to the island, hop on a speedboat departing from Nathon Pier for a 45-minute ride. Nathon Pier is about 11 minutes’ drive from your villa.